Knowing for manufacturing, supplying and wholesaling best in Industrial Lab Equipment, Reliable lab equipment co., is an ISO 9001:2008 certified firm, which was established in the year 2010. Offered class Industrial Lab Equipment range is inclusive of Civil Engineering Equipment, Pharmacy Equipment and Civil lab Equipment. By employing modern machines and best quality raw materials, our skilled professionals manufacture the offered products in compliance with the international accepted standards of quality. These products can be customized as per the detailed requirements by our clients. Offered at reasonable prices, these products are highly demanded among our customers. Due to their sturdy design, low maintenance, high performance and long serving life, the offered product is highly appreciated in the market. We are backed by a sophisticated infrastructure, which is installed with modern machinery that is useful for making the equipment as per client’s requirements. To assure that our products meet industry quality norms & standards, we also have an in-house quality checking unit, which is equipped with modern tools and machines. This is handled by a team of quality controllers, which stringently test all the manufactured products on various parameters to ensure fault ness. Due to the stringent testing of all these equipment, these are demanded by the clients due to their longer functional life, accurate results, dimensional accuracy, compact design and easy handling. Under the efficient guidance of, Mr. Randeep Singh, who has deep knowledge of this field, we have carved a niche for ourselves in the market. His client centric approaches, ethical business policies and sound strategies have enabled us to make a huge clientele across the globe. Manufacturing of Industrial Lab Equipment. Constructive self-criticism, self improvement and personal excellence. “Reliable lab equipment co”, is blessed with highly skilled and talented professionals who are hired after a stern and thorough recruitment process. Besides, these team members have gained years of experience in the concerned domain. These team members work hard to render a comprehensive range of equipment in the market. Apart from this, our personals are latest market trends and are regularly trained to keep their knowledge update. Leveraging on the modern tools and equipment, we are able to offer a huge collection of Industrial Lab Equipment. We are constantly supported by our expert team of professionals. These teams ensure to analyze the variegated demands of our customers and offer the products accordingly. 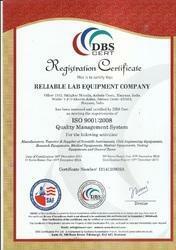 Our company is defined as a quality centric firm engaged in offering a broad gamut of Industrial Lab Equipments. Our complete range is designed using high class basic material and modern technology in compliance with set industry standards. In order to ensure their supreme quality, we have established a quality checking unit that carries stringent tests right from the procurement of basic material till the final delivery of the finished product array. Our stringent quality standards make us to be recognized in the globe. Our infrastructure facility has all the sophisticated machineries and tools. The manufacturing department has access to the latest technology, to enable us to offer quality range of Industrial Lab Equipment to our customers in a timely manner. The installed capacity of machines ensures to cater to the bulk demands and we also have an efficient team of professionals to oversee that the range of equipment that is manufactured as per the quality norms. We have several departments for each production process such as base material sourcing quality control, R & D, production and marketing.